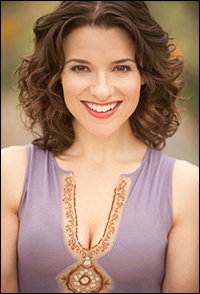 The company of the first North American tour of Stephen Schwartz and Winnie Holzman's Wicked welcomes Jenn Gambatese as Glinda beginning Feb. 26 in Costa Mesa, CA. In related news, Curt Hansen will begin playing Fiyero in the same company starting March 20 in Tucson, AZ. Gambatese joins a cast that includes Dee Roscioli as Elphaba, Kim Zimmer as Madame Morrible and Tom McGowan as The Wizard. The company also features Justin Brill (Boq), Clifton Davis (Dr. Dillamond), Demaree Hill (Nessarose) and Laurel Harris (standby for Elphaba) with Dina Bennett, Lauren Boyd, Kyle Brown, Antonette Cohen, Rick Desloge, Timothy A. Fitz-Gerald, Napoleon W. Gladney, Brenda Hamilton, Courtney Iventosch, Trevor Ryan Krahl, Philip Dean Lightstone, Marissa Lupp, Michael Mahany, Jonathan McGill, Kevin McMahon, Cassie Okenka, Shayla Osborn, Christopher Russo, Adea Michelle Sessoms, Sarah Schenkkan, Pamela Shandrow, Ben Susak, Shanna VanDerwerker and Mikey Winslow. Gambatese starred on Broadway as Jane in Tarzan and Natalie in All Shook Up. Other Broadway credits include Hairspray, Is He Dead?, A Year with Frog and Toad and Footloose. She recently appeared in the Encores! production of Fiorello!, playing Dora. Wicked is playing through March 17 at the Segerstrom Center for the Arts in Costa Mesa, CA. Tickets can be purchased at SCFTA.org, at the Box Office at 600 Town Center Drive in Costa Mesa or by calling (714) 556-2787. The hit musical will play The Tucson Music Hall, March 20-April 7. Tickets are available at the TCC Box Office, online at broadwayintucson.com or ticketmaster.com/wicked or by calling (800) 745-3000.